1. The annual tree farm day trip with the entire family to select and cut down our own Christmas trees is a distant memory. 2. No more perusing the “Best” catalogue, Kiddie City and Toys “R” Us circulars and folding down the pages of the toys and games I just have to have. 3. A hopeful letter to Santa just doesn’t serve the same purpose. Though the butterflies are still there when I see him in the mall, I’m beyond the age of excitably waving at him and taking a picture on his lap. 4. Decorating the Christmas tree and singing along to the Jackson Five Christmas songs isn’t the same. The family togetherness I felt when I was younger is missing. 5. Gone are the days of attending the school’s Holiday Bazaar and making the ten to twenty dollars I saved really stretch in order purchase gifts for my family. 6. The absolute feeling of glee from watching every single Christmas television show, movie or special has sadly faded. 7. Baking cookies in the shapes of reindeer, Santa, Christmas trees, jingle bells and angels sprinkled with green and red sugar is not as fun without with my mom, sister and brother. Not to mention, the cookies are not especially made for Santa. 8. There’s no point in forcing myself to go to sleep early on Christmas eve in hopes of Christmas day coming sooner. No late night conversations using the gift wrap rolls to talk through with my sister in the bed across from mine to express my anticipation. 9. Why run down the stairs with amazement no later than 4:00 a.m.? There are no gifts under the tree from Santa, and my cookies will remain untouched until I bring them over to my mother’s house. 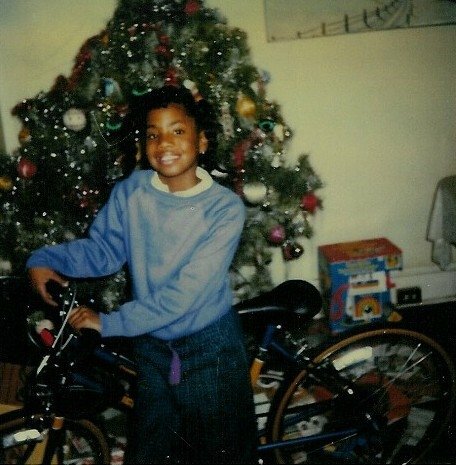 My dearest “Childhood” Christmas, I truly do miss you. Do you have something you miss about “Childhood” Christmas? Please feel free to share, and leave a comment. Wow, Auntie but look at the brighter things, You married Uncle Sean, you have a wonderful house and car, you gave birth to Quinn Victoria Franklin and you started a new family are excited to see. As long as you have distant memories of Childhood, you still yourself inside and out. You are absolutely correct Jalen! I am very blessed and grateful for the life I have. It is wonderful to be able to celebrate the holidays with family.